The Gamecube has been some what of a mixed bag, it's provided us with some classic moments but maybe its let us down, once more, with third party titles. It's pretty safe to say its done better than the Nintendo 64. We expect alot of our readers to be new to Nintendo or maybe they've missed out on the last couple of consoles. As you may know Wii will be Nintendo's first console to be truly backwards compatible, with this in mind some of our staff members be looking back over our favourite games on the ageing console. Hugely underrated in my opinion, the graphics were different but Miyamoto created a fantastic style, a classic among Zelda games? Perhaps not, but certainly a classic in its own right. Retro created a masterpiece adventure game, loved the controls and the atmosphere of the game, proof once more than first person games can work on consoles. Another great Mario game, okay its not perfect and wasn't quite the Mario 128 we were hoping for but still a solid effort. Buying on a launch to bulk up my games I was pleasantly surprised to grow fond of Tricky, countless hours were spent perfecting tricks and beating high scores, superb. Another surprise hit for me, Wario World is somewhat of a simple platformer but I really enjoyed the level design, music and general feel to the game. Great work treasure. Gamecube has had some great titles, but its suffered similar fate to the N64 – having great first party titles just isn't enough. Wii already looks more promising on this front, so hopefully the next 5 years will be more rewarding to be a Nintendo owner. The other note worthy games in my collection would be F-Zero GX, Resident Evil (1, 0, 4), Metroid Prime 2: Echoes, Starfox Adventures, Starfox: Assault. A great immersive game, with very subtle hints guiding you, making it feel like you are discovering the world. Similar to..
Where as an extraterrestrial you explore the strange planet while collecting parts of your space ship. Kind of like..
A Zelda that was a breakthrough in co-operative multiplayer. I hope there's a VC online updated version of that! There were loads of other games that were also great. Choosing just 5 was very difficult! 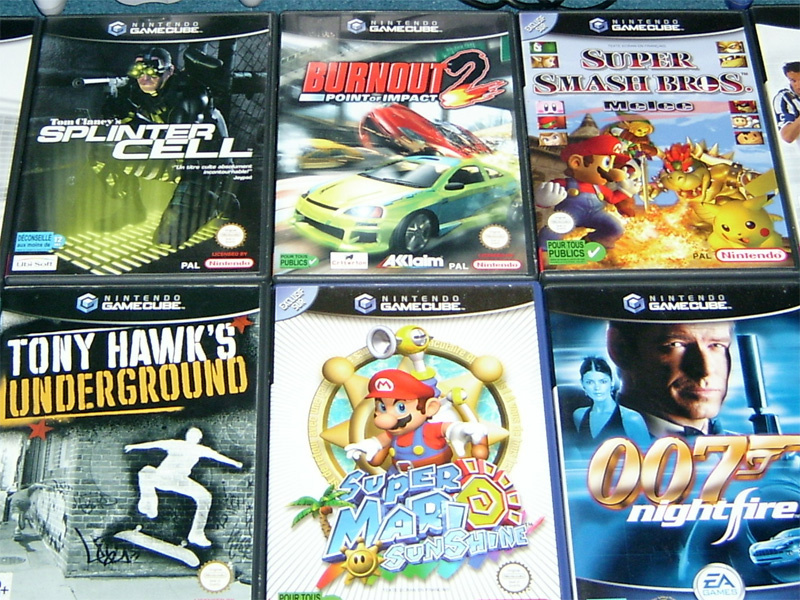 Near misses include Warioware, Star Wars: Rogue Squadron, Super Monkeyball, Resident Evil, Geist and Eternal Darkness. Well, what can I say? Probably THE most underrated game of all time. BGE was a perfect adventure that broke the stereotypical mold for female lead characters. There are two types of people in this world; those who love BGE and those who have never heard of it. Yes it is a port of the DD game, but it was still fantastic. I doubt I really need to elaborate on what this game is about. Quite fitting that one of my favorite GC games has N64 graphics- shows that looks mean nothing when it comes to gameplay. Another Ubisoft title makes it into the elite top 5. Sands of time offered stunning gameplay, an excellent story and a refreshing break to an over exhausted Tomb Raider genre of game. Hilarious, innovative and a welcome return to Luigi as the star of a game. It was a bit on the short side, but contained plenty of replay value. The ones that didn't quite make it: The Legend of Zelda; The Wind Waker - This game didn't live up to the previous Zelda titles, the story was a bit weak. For gameplay however, there were no flaws at all. Sphinx and The Cursed Mummy - Yes, thats a Eurocom game! This one surprised me with how good it was. Star Fox Adventures - A decent title, not a scratch on Rare's old stuff. Fire Emblem: Path of Radiance - Stunning turn-based war game, just missed out on the list. Tales of Symphonia - An awesome RPG, something the Cube seriously lacked. SSX3 - The best SSX, period. Several years ago no one thought sonic would ever be be on a Nintendo console. Then out came this one disc with all of his greatest hits, fantastic! Classic Zelda action but this time in a immense cartoon world, adding a new level of freshness to the franchise. This one didn't disappoint me in any way. Many hours of my life were spent on this game. I always found more things to scan during each play through. It was not an easy task to get 100% in this game! The only truly groundbreaking RPG to hit the Cube, a rare classic. This game can take well over 70hrs to complete, but each second of this is supported with its stunning storyline. A hugely underrated puzzle game. It made its way to the bargain bins very early on in its life. The main reason for this is the difficulty level and long and infuriating learning curve. With Twilight Princess being released soon, I have only recently been pushed to play this console selling title after having owned it since its release. I did not know what I was missing; the graphics were, perhaps amazing for their time, nevertheless they still stand out over a year later. This title will be stored forever in my heart for many reasons, but it was the water that just washed me away. I can still see it now, my boat gently gliding through the glimmering waves in the daytime sun. This is another game I picked up at a low price but since when was a game’s quality determined by the price. The beat-em-up that everyone believes they are the undisputed champion of, messages of dominance spread throughout internet message boards claiming the title. Well it seems the staff here at NintendoLife.com are pretty mixed in opinions, there are no real strong winners and would suggest a nice diverse collection of Gamecube games available. If your buying a Wii this Christmas season, we'd strongly suggest you pickup a Gamecube controller and some of the games listed above, they're all tried and tested games that'll still look great on your new shiny Wii console.